CARBONDALE, Ill. – Mark Byrd is working on correcting errors that have yet to be made. The professor in the physics degree program at Southern Illinois University Carbondale spends a good deal of time mulling how to anticipate the inevitable errors – known as “noise” – that futuristic quantum computers will make, and finding ways to correct them. Finding ways to quiet this “noise” is perhaps the biggest challenge holding back the development of this these next generation machines, which promise to solve some problems exponentially faster than their classical computing predecessors. Byrd just received a $180,000 grant from the National Science Foundation to study the problem. The “quantum leap” is one of the National Science Foundation’s 10 big ideas, and the U.S. congress recently passed the National Quantum Initiative to ensure this type of research continues. How important is staying ahead of the curve on quantum computers? Well, Byrd understands this issue well enough to warrant a visit from the FBI, which is mighty interested in their national security implications. Such is the game-changing potential of quantum computers, if researchers such as Byrd’s can figure out how to overcome the noise. Traditional, or “classical” computers rarely make errors. Even so, today’s technology comes complete with error correction software and redundancies built in. Otherwise, items like CDs and DVDs would be done with the first scratch they receive. Quantum mechanics promises to bring big changes to the world of computers. But the world it occupies might seem pretty strange to the everyday person because we don’t necessarily see it in practice the way we witness classical physics. The classical physics first formulated by Newton and built on by countless other researchers during the ensuing centuries, describes the laws of nature we see in our everyday lives, and they’re pretty awesome to behold. As it became possible for researchers to study nature at smaller and smaller levels, however, they began to see strange phenomena that did not appear to follow such classical laws. By the late 1920s, they begin to theorize different laws that apply at the atomic or sub-atomic level. Quantum mechanics was born. Quantum computers come with great promise, as well as challenges. Although quantum computers are largely non-existent, a few very small ones are in use, including one owned by IBM that is publically available for researchers. It is small and very “noisy,” Byrd said, consisting of just five Q-bits, the quantum analog to the classical bits. Another such computer in development promises 50 Q-bits, but that’s still too small to build in the kind of redundancy and error correction needed in a practical quantum computer. Noise in a computer can come from several sources, including heat or simply during the transformation of its state. In a traditional computer, the object is to change the state from a 0 to 1, hence the digital designation. In quantum computer, however, the machine can be in more than one state at the same time – a 0, a 1, or any superposition of the two. It’s like being in both the zero state and the one state at the same time. It can also be in a superposition of two zeroes and two ones at the same time, which is something a classical device cannot do. This gives it abilities that are not available for classical machines. A quantum computer also is highly susceptible to influence by its environment, so much so that even taking a scientific measurement of its state will change the state it was in. It can also experience “entanglement,” a theory put forth only about 30 years ago, that describes two or more quantum systems in a state where it becomes impossible to treat each system independently. Subsequently, the only way to describe this new “entangled” system is as one, conjoined system. The simplest example of this is the superposition of two zeroes and two ones. That’s a lot to deal with. So scientists working on quantum error correction traditionally start with the assumption that the quantum system is somehow isolated from such influences, and that it is not entangled nor correlated with its environment in any way. That’s where Byrd’s approach will differ. But by catching the systems in the act, so to speak, and looking at different examples of how it works and examples of the different states it could evolve to, researchers might be able to classify those errors and look for ways to correct them. “We eliminate the false premise of isolation, which is very hard to do, and start from a more realistic, real-world situation,” Byrd said. “It’s a pretty good assumption the system is not isolated, and approaching it this way is a lot more realistic. “It’s getting our hands dirty, in some sense,” Byrd says, laughing. What it ultimately comes down to, however, is control. In the classical physics world, for example, clock designers use counterweights to tap into a natural force – gravity – to overcome the friction that would eventually stop a pendulum from swinging. In a sense, quantum control research is trying to do same thing. “We’re just getting started at the quantum level, and because that world is so small and delicate the noise is more of a problem,” Byrd said. If quantum systems can be controlled, the technological revolution they promise doesn’t end with computers. It could extend to a host of new devices and networks and lead to everything from better medicine to tiny batteries holding enormous amounts of energy to atomic-based power without the toxic leftovers. We may also soon have quantum simulators and micro machines that evolve quantum mechanically. The list of possible new quantum devices is quite long. But those possibilities start with fundamental research like Byrd’s. “The ability to correct the errors, which really just a form of control, is the biggest thing holding us back right now,” Byrd said. Going forward, Byrd will work with collaborators in Australia, Jordan and Spain, as well as involving an SIU undergraduate and graduate students. 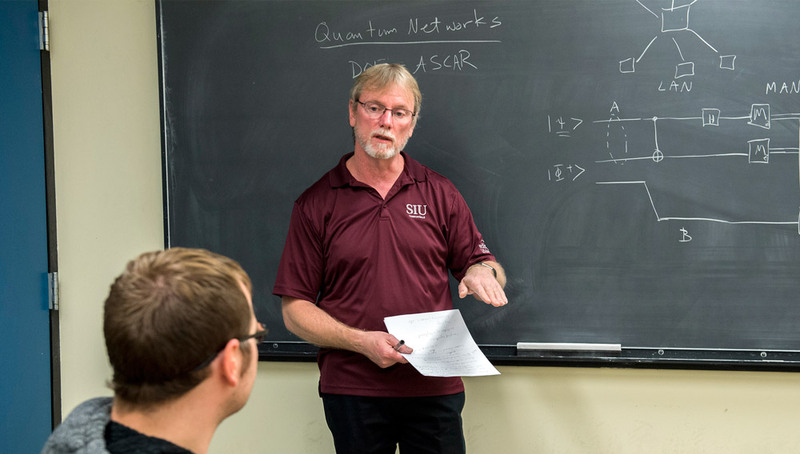 Much of the work will focus on developing simple models and theory – intense blackboard equations and discussion – as well as computer modeling. All of the work seeks to peel back the veil on this sub-atomic world, and strange laws that govern nature at such a level. It’s a place where Byrd is right at home. -Physics professor Mark Byrd has received a $180,000 NSF grant to study ways to correct errors in futuristic quantum computers. -Such computers, as well as other quantum mechanics-based devices, could revolutionize technology. -The work will involve international collaboration, as well as SIU undergrad and graduate students.